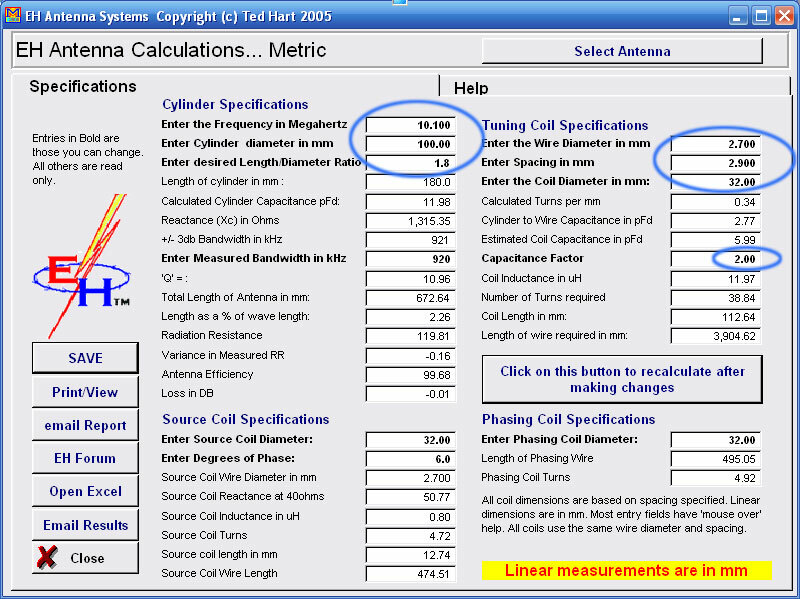 This article describes how to calculate all necessary physical dimensions in order to construct a flat EH antenna for your chosen band. The construction for all flat EH antennas are identical. Some general principles of construction are discussed and it is possible to calculate physical sizes for each band using a programme kindly supplied by VK4ANW. I also discuss the tuning of flat EH antennas on my TUNING page. The construction of all flat EH antennas are identical and the only difference between them is that the size differs according to the frequency of operation. This is true for the tiny flat 2m EH as it is for the 160m flat EH antenna. Dimensions for each antenna can be determined from the program eh6.exe coded by VK4ANW. The program by VK4ANW was written for cylindrical EH antennas but by simple transformation of the diameter of cylinders to one of surface area of a flat EH antenna, it is quite simple to derive the necessary dimensions for any flat EH antenna. The VK4ANW requires user input i.e. mid-frequency of your chosen band, diameter of cylinder, ratio between cylinder diameter and cylinder length, diameter of wire for the tuning coil, winding step of wire used for the tuning coil (normally the same diameter as the wire itself) . The program eh6.exe by VK4ANW can be downloaded HERE (eh6.exe 1,6 Mb). Compatible operating systems (OSs) are Windows 98, 2000 and XP. I am unsure whether it works under Windows Vista, Apple Mac OSs or Linux. WORKING EXAMPLE ON USING THE PROGRAMME: The following example relates to a flat EH antenna cut for 10 MHz.. The mid-frequency is 10,1 MHz; diameter of cylinders 100 mm. ; the ratio between cylinder length/diameter is 1,8; diameter of tuning coil is 32 mm. ; diameter of wire is 2,7 mm., the winding step (spacing is) 2,9 mm. See Pic.1 below. Pic. 1 Calculation of EH antenna on 30-memters band (10,1 MHz). Cylinder diameter is 100 mm, therefore we multiply this value by 3.142 i.e. 100 x 3,14 = 314 (315 mm. ); Note this value is not critical plus or minus a few mm. The cylinder diameter to length ratio is 1.8, therefore the horizontal length of the flat plate = 100 times 1.8 = 180 mm. Diameter of tuning coil - 32 mm. Wire diameter - 2,7 mm. Spacing (winding step) - 2,9 mm. Pic.2 Size of EH antenna on 30-meters band (10,1 MHz). The critical dimensions for calculation (which determine its angle of radiation) are the cylinder diameter/length. The followings cylinder length/diameter ratios work well depending on the choice of band: 1,8 MHz - 215/110 mm. and more; 3,5 MHz - 110/75 mm. and more; 7 MHz - 75/50 mm. and more; 10 mhz - 50 mm. and more; 14 MHz - 50/32 and more; 18-28 MHz - 32-20 mm. and more; 145 MHz - 15/8 mm and more. The ratio length/diameter we choose range in ratio between 1-6. What anymore ratio length/diameter, or than anymore diameter of cylinder (there is length/diameter at unchanging ratio) - the anymore bar of key-in of antenna. Please play with the program and see how antenna parameters change before you construct your antennas. Also please note that in the program, a phasing coil in our flat EH antenna is not used, because it is not necessary to compensate for any stray capacity of the central wire that passes through the centre of the pipe (this is important however for the cylindrical variant of EH antenna). 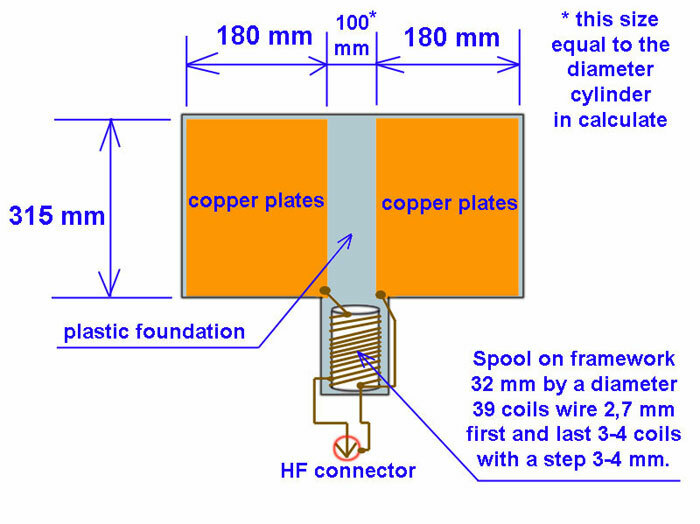 Please note that the flat EH antenna does not use a ‘source coil’ and this will be discussed on my tuning page. By the way, it is possible to enter data i.e. dimensions of cylinders, wires etc. based on what you have available because this is a big part of the fun in experimenting and playing with EH flat antennas. Suitable materials for constructing the rectangular plates include (besides copper plate itself), "copper foil fibreglass" or a "copper net". The above describes how to derive the dimensions of flat EH antennas for the band of your choice. The next stage following construction is to tune the antenna itself. This is done by connecting the central wire from the middle of the SO239 to the first or second turn of the tuning coil. This is described in much more detail on my TUNING page.